Ever wonder why Newsweek was sold for $1? | can i just finish my waffle? Ever wonder why Newsweek was sold for $1? OR – WHY ARE OBAMA SUPPORTERS SO DUMB? Sarah Palin’s husband, Todd, has purchased Newsweek magazine. This is an outrage, right? Now tell me how this is not a conflict of interest? This is old news, but it is relevant as to where Newsweek is coming from. You might say they are “owned” by the DNC obama organization. 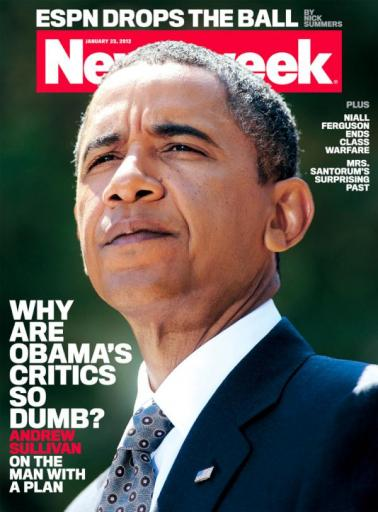 With that in mind, it is no surprise Newsweek covers their imaginary magazine with references to obama critics as being dumb. I take issue with that one. I am wondering why obama’s supporters are so dumb. Of course, IF that were on the cover, there would be protest all over the media. You will never see a headline “Why are obama’s supporters so dumb.” Never.